Gladiators were divided into different classes according to their weapons and fighting styles. There were strict rules and protocol surrounding the fights of gladiators. A gladiatorial fight would usually involve two gladiators but similar types of gladiators such as the Murmillones, would not normally fight each other. The first Roman Gladiators were prisoners of war and used the weapons and equipment characteristic of their people. The early enemies of Rome included the Samnites, the Thracians and the Gauls (Gallus) and gladiators were named according to their ethnic roots. This changed over the years and the names of the different types of gladiators reflected their combat techniques such as Secutores (chasers), Bestiarii (beast fighters) and Retiarius (net fighters). Gladiators were always clothed and armed to resemble barbarians with unusual and exotic weapons and their fights depicted famous victories over barbarians and the power of the Roman Empire. The Murmillones symbolised Vulcan the God of Fire. The Romans enjoyed the spectacle of watching the fighting styles of their defeated enemies. But the Murmillones, a variety of the Secutores, emerged to fight the Retiarius gladiator. The Retiarii used the trident as a weapon which was also well known as s symbol and weapon of Neptune, the God of the Sea. The Murmillo (meaning 'the one following'), symbolised Vulcan the God of Fire, because fire always pursues. A fight symbolising the opposites of fire and water. The Murmillo was a variation of the Secutores gladiators. What type of gladiator was a Murmillones aka Myrmillo or Murmillo? What weapons and armor did they use? What was their style of combat? And what type of gladiator was matched as their opponent? - Opponent: This type of gladiator usually fought with a Retiarius (pl. Retiarii meaning "net-man" or "net-fighter") who was a Roman gladiator who fought with equipment styled on that of a fisherman. The Retiarius (Retiarii) were lightly armored so they had the advantage of agility, mobility and speed. - Weapons: This type of gladiator fought with a sword (first the the gladius which was eventually replaced by the Spatha). The gladiators who used the gladius were those who were armed with body-shields such as the secutor, hoplomachus and the dimacheris. - The purpose of the small eye-holes in the helmets of the opponents of the Retarius was to prevent the narrow prongs of the retiarius' trident from penetrating to the eyes . Combats between similarly armored gladiators would demonstrate superior skills when gladiators were fighting against equally armed opponents. However, contrasting types of fighters were also carefully selected in order to achieve a reasonably fair pairing. Matched pairs of gladiators of would ensure that one fighter was hampered by heavy armor whilst the other was lightly armed. One gladiator might have freedom of movement but with little to nothing to protect him, whereas the other gladiator might be more heavily armed and protected but restricted in his movements by his equipment. There were therefore many different types of gladiator, including the Murmillones, who specialised in using specific weapons, armor and shields. 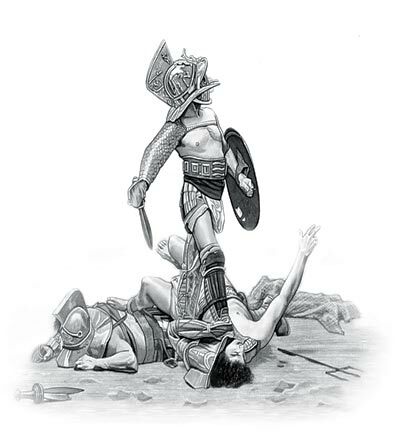 The content of this Murmillones category on the different types of gladiator who fought to the death in the gladiatorial combats staged in Ancient Rome provides free educational details, facts and information for reference and research for schools, colleges and homework. Refer to the Colosseum Sitemap for a comprehensive search on interesting different categories containing the history, facts and information about Ancient Rome. Interesting facts and information on this type of gladiator: their weapons, their armor and their style of combat.